Credila Edu. Loan: Is It Worth Spending Over Rs.20 Lakhs For An MBA Program Abroad? Is It Worth Spending Over Rs.20 Lakhs For An MBA Program Abroad? An MBA costs a lot of money and requires effort. For those who are aiming for B-schools abroad, the fact to be remembered is that these programs can cost upwards of Rs.20 lakhs. So the question which crops up is, is it worth? Internationalization: Foreign universities have students from all over the world. So, from the word `go’ it is global exposure in terms of interaction. This sets up a student for a global work atmosphere which is key to landing a job with a good international organization. A typical classroom might have around forty students from diverse cultures and backgrounds and this is one of the most remarkable benefits of studying abroad. Exposure: An MBA abroad would mean relocation to a foreign country and this gives students the added advantage of living in a foreign country and adjusting to the culture and life style there. This preps up the student for a future in which it might be necessary to live abroad or travel frequently. Course structure and faculty: One of the key factors which can influence this decision positively is the faculty in international B-Schools. Highly literate and from diverse backgrounds, the faculty comes with the exposure and experience to recount global case studies and international experiences giving students the rich exposure that a program such as this rightly deserves. Cost: is a large deterrent when deciding to procure an MBA abroad, but when you look at the job opportunities as well as the salary structures which await international MBA students then this factor diminishes and loses its importance. A typical post-MBA job abroad might get a salary of US$100,000 which works out to approximately Rs.45 lakhs. When weighed against an investment of say around Rs.20 lakhs, it makes monetary sense to opt for a program which ensures that your efforts were worth it. Better Compensation: Senior level roles offer greater compensation and there is proof that an international MBA in a CV can result in salary growth along with a great starting salary. The top ranked schools in the FT Global MBA rankings reported increases in salary of over 100% and all schools, in the 100 schools ranking, reported increases of over 50%. Career propulsion: An MBA abroad sets up a student for a career jump in India as students with international MBAs are wanted and offered good positions in leading organisations. Also, if the student is looking for a career abroad, then it is extremely likely that an international MBA will be favoured more than a local one. Thus, an MBA abroad ensures that the student lands his or her dream job soon after completion of the program. However, while all these reasons make great professional strength, the most important question to be asked is not whether it is worth spending Rs.20 lakhs but more importantly, will this program help me to achieve my personal goals. So while the answer to this question remains personal, overall it makes huge sense to go for an MBA abroad. Good site, Getting ready is a fundamental instrument that is asked for in the present globe to succeed. The word planning way 'to hold up'. Getting ready company website gives the reasonable vision that makes a human a human. For those students, who are aiming for B-schools abroad, the fact to be remembered is that these programs can cost upwards of Rs.20 lakhs. I thinks it's not justice with student. 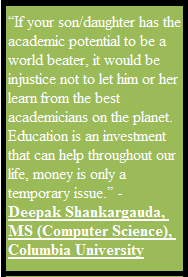 Minister of education should take step to reduce that education expenditure. I have www.professionalessaywriters.com/faq for all students.